This week I finally finished the Blood Angels commission! Yay, sweet sweet freedom. Now I can get back to work on other projects and start my Adepticon prep in earnest. So far, I've primed the bust of Captain Barbosa and started work on the Leviathan dreadnought. 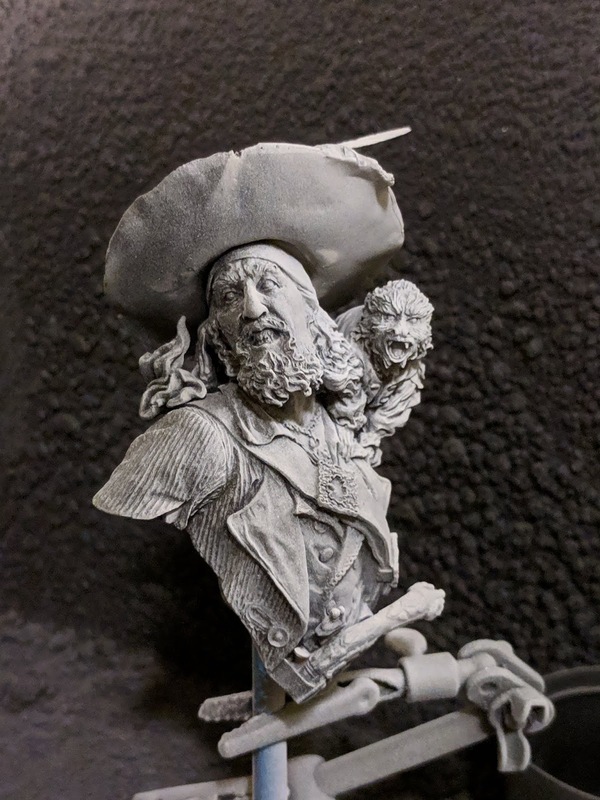 Technically called "Pirate's Fury", this bust from Nuts Planet was a gift to my girlfriend for Christmas. Since I had no way to hide that I was working on it, I gave it to her unpainted and now I am getting started on it. After I had finished painting the Death Company marines, I got to work cleaning him up and getting him mostly assembled. His head and hat are currently loose though and I will be painting the head off of the body. Now that I have an airbrush set up, the plan is to base coat the head and hair with it. That way I can keep the layers thin and work in some skin texture. I need to look up a bunch of reference photos of Barbosa from the first Pirates film so I can color match to the best of my ability. I'm so happy that these guys are done. 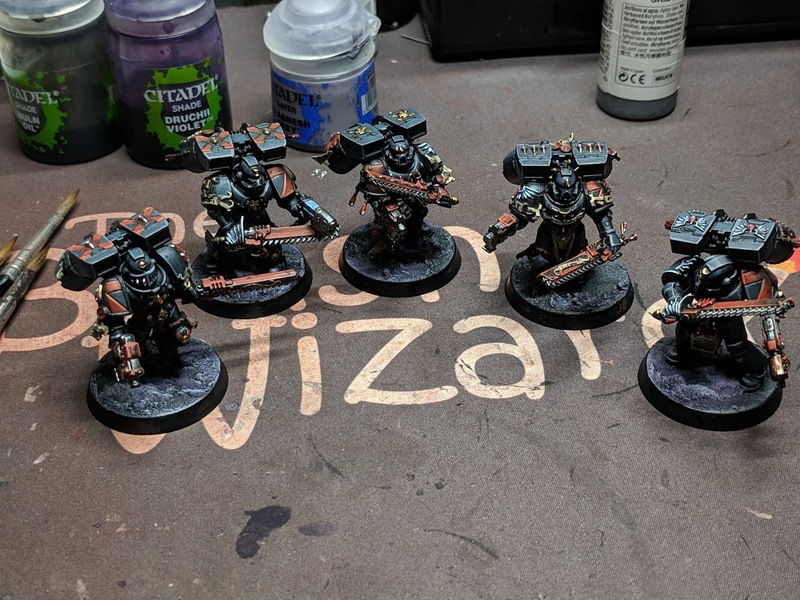 They went a lot quicker than the first 5 Death Company marines. I think part of it has to do with the fact that I painted the bodies and then added the backpacks on. That way I didn't have to go back and do the packs after the rest of the model was finished. But they are all done now, expect a Miniature Monday mega-post in the future showing off the entire army. Tuesday night I had intended to start work on Barbosa, but after priming him and deciding that I wanted to airbrush the face I started on the Leviathan instead. Luckily having a #8 brush makes painting large panels a breeze and I was able to knock out the black armor panels in about 2.5-3 hours. 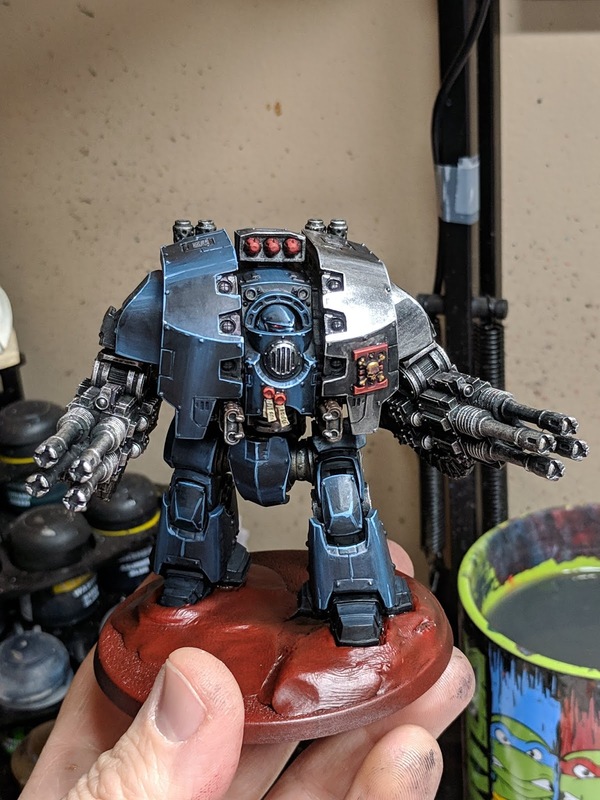 The most tedious parts of this paint job were the knee caps and the outer chest panels. The main issue with the knews was dealing with their shape and lack of hard edges. 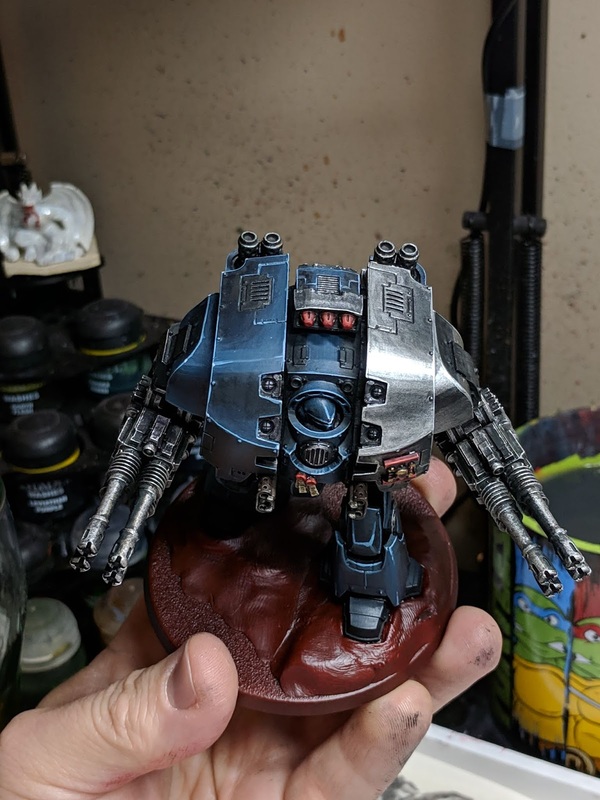 The chest panels are just a strange shape and it made figuring out the highlighting a challenge. Over the course of the night I was able to paint nearly all of this guy. I still need to glaze the blue-black armor with green wash and glaze the silver with blue, but I'm out of Drakenhof Nightshade. Then its on to weathering, details and the basing. I love how this guy is coming together and can't wait to see him finished. I'm definitely sold on using the larger brush for stuff like this, it makes things super speedy. I ended up so engrossed with this project that I didn't realize it was after midnight when I finally called it quits. That's the first time that has happened in months, and it feels good. That's all for now. He's going to the game shop tonight and marching with his dreadnought brethren against Dark Eldar.